My mom tells a story that when I was a toddler, I used to push my older brother and sister off my dad’s lap so I could cuddle with him all by myself. I still do this with my kids and husband. It might look different today, but my goal is the same: I want more love. And I’m not above pushing someone else out of the way to move myself forward. My love hunger stumps me. I’ve been a Christian since I sat on a little plastic Sunday-school chair and learned Bible stories from a flannel-graph board. If I’m so into Jesus—and I promise you, I am—then why am I still needy? Why is my heart such a love vacuum? I long to be known, adored, and fully accepted. I may not verbalize it often, but this desire plays on repeat in my internal dialogue. The fact of the matter is, I want more love than any human could ever give me. I often look to my husband, children, and friends to fill this ache that churns within me. When will I learn that my people can never fully satiate my longing for more? I’m so thankful that the Bible reminds me of this intensely personal truth: God is my heavenly Father—my Abba—who loves me in the way I’ve always wanted to be loved. I do want the love of my people. And that’s okay. But I can’t expect imperfect human beings and relationships to satisfy my heart cravings. Only God can satisfy. Man! I sure like the sound of that, don’t you? Don’t you want to be “rooted and established” in God’s love? Don’t you want your awareness of His love to fill you “to the measure of all the fullness of God”? Sign me up! I need it. I want it. I want it all. Check this out. The New Testament part of Scripture was written primarily in Greek. The transliteration of the Greek word for rooted that’s used in this passage is rhizoō, which means “to cause to strike root, to strengthen with roots, to render firm, to fix, establish, cause a person or a thing to be thoroughly grounded.” Figuratively it means to “become stable.” So my personal summary is this: God’s love should stabilize my faith. My acceptance of His love for me will strengthen and “fix” me. God’s love is that thing I need the most. I want that strength. I want that stability. I want every blessing of His love in my life. His Word tells us the love-well of Jesus is wide, long, high, and deep. So today, I’ve decided to stop expecting others to meet my love needs and am instead asking God to help me be rooted and established in the fullness of His all-satisfying love. Join me? Lord, Please help me to be rooted and established in Your love. Would you stabilize my faith and allow me to grasp the power of Your love for me? Read Psalm 27:1-14. Note some of the ways that God shows His love for us. Write down a Scripture verse about love and apply it to your life. 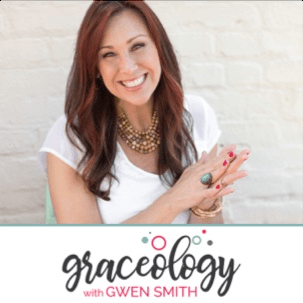 We’re pleased to announce the new GRACEOLOGY with Gwen Smith podcast! Hang out with Gwen and friends when you go on walks, exercise, run errands or travel. Podcasts are also perfect to listen to as you do household chores! (Laundry anyone?) Each GRACEOLOGY with Gwen Smith podcast episode is filled with fun, faith-focused, grace-filled conversations that will help you know and trust God more. These discussions are going to encourage you in meaningful ways to live out and lean on the GRACE of Jesus in the midst of cluttered, messy days. CLICK HERE to listen on iTunes, or visit GwenSmith.net/Graceology for more information.